The borders of the Roman Empire (also known as Limes) in Great Britain (Hadrian’s Wall and the Antonine Wall) and parts of the Limes in southern Germany have been added to the UNESCO World Heritage List as "Frontiers of the Roman Empire" (WHS). The so-called Lower Germanic Limes will be nominated by the Dutch government in cooperation with the German federal states of North Rhine-Westphalia and Rhineland-Palatinate in 2020 as a supplement to these "Frontiers of the Roman Empire". In recent years, many initiatives have been developed to increase the perception of the Dutch Limes. After all, this is largely underground and therefore invisible. In this publication, the role of museums in these challenges is examined. EXARC played an important role in the publication of this volume. 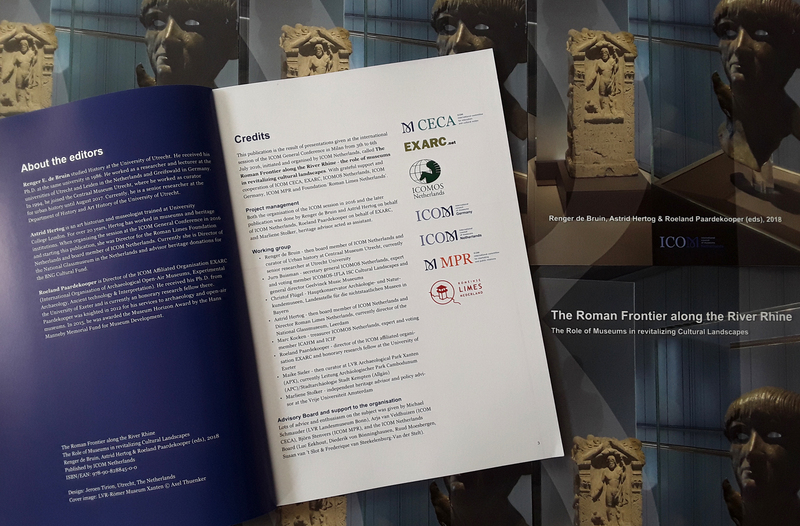 This English-language publication contains eight contributions and is based on the international session at the ICOM General Conference in Milan in 2016, organized by ICOM Netherlands.Through an international group of experts, topics such as museums and cultural landscapes, visitor experience, tourism, cooperation, and government responsibility are described and recommendations made. Museums play a crucial role in the revitalization of cultural landscapes, so important to the UNESCO World Heritage List. The publication "The Roman frontier along the River Rhine" is available as an online publication: https://www.icomnederland.nl and can also be ordered as hard copy from ICOM Netherlands via the same website. De Bruin, Hertog & Paardekooper (eds), 2018.